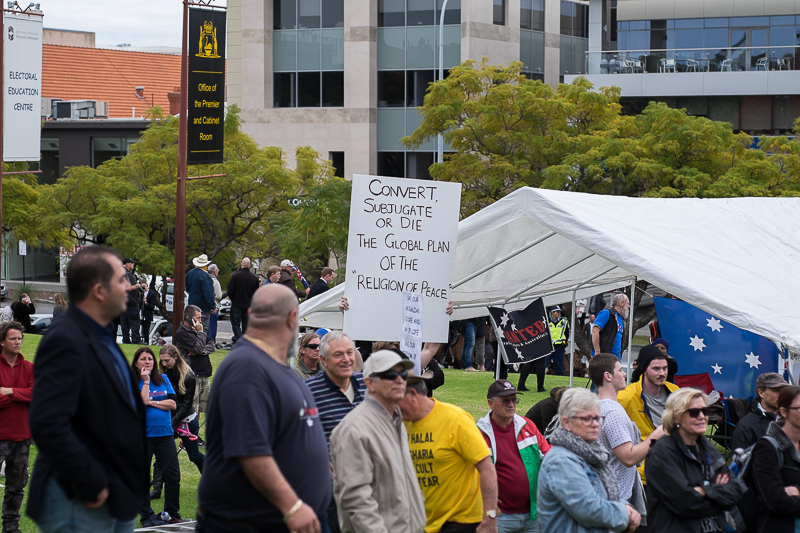 After spending time with both sides at the reclaim Australia rally in Perth, Western Australia, we are still without a complete understanding of what they actually want. 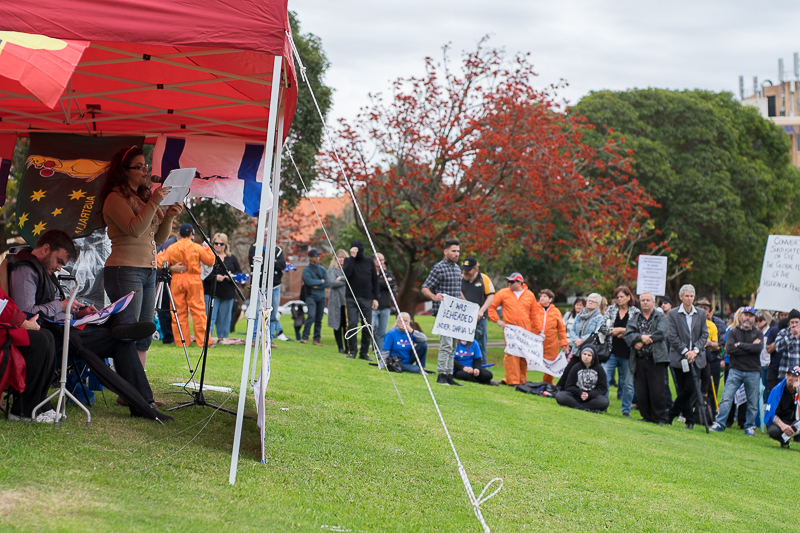 The reclaim Australia speakers seemed unable to put across a tangible message of the purpose of their movement.The protestors of the reclaim Australia rally didn’t really seem to be there for any reason other than to rabble rouse, and in fact the only arrests on the day were two of the protestors opposing reclaim Australia. Racism – the belief that all members of each race possess characteristics, abilities, or qualities specific to that race, especially so as to distinguish it as inferior or superior to another race or races. 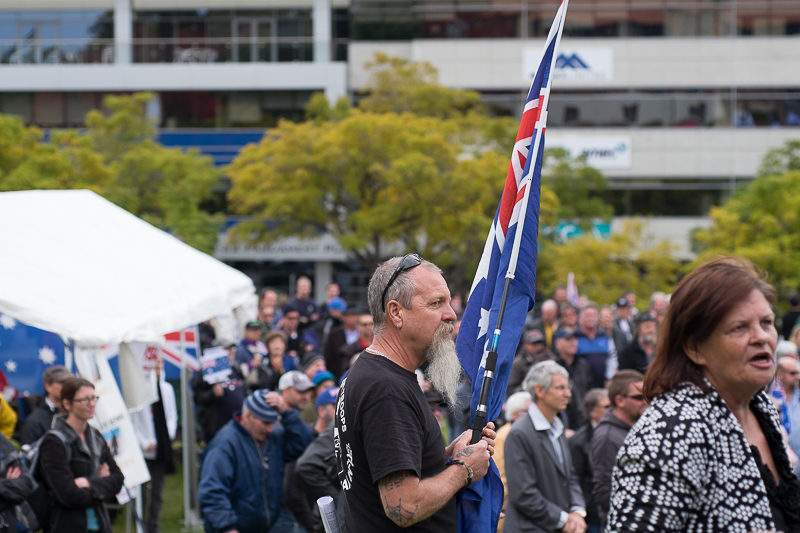 On one side there is the Reclaim Australia supporters – a movement with a core focus on maintaining the “Australian” way of life, which we are lead to believe is in imminent danger, lets call them the “Right” – a myopic view of anyone who holds conservative beliefs. 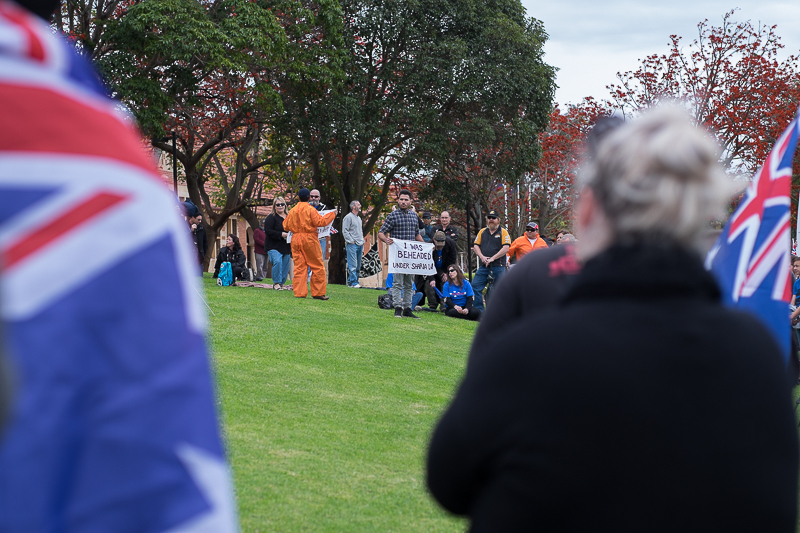 On the other side there is the anti-reclaim Australia protesters, lets call them the “left”- a seemingly throw away term for anyone that does not agree with the reclaim Australia ethos. Left: We were the first non-racists. The right are simpleton xenophobes that want to maintain our homogeneous Anglo-Saxon culture. 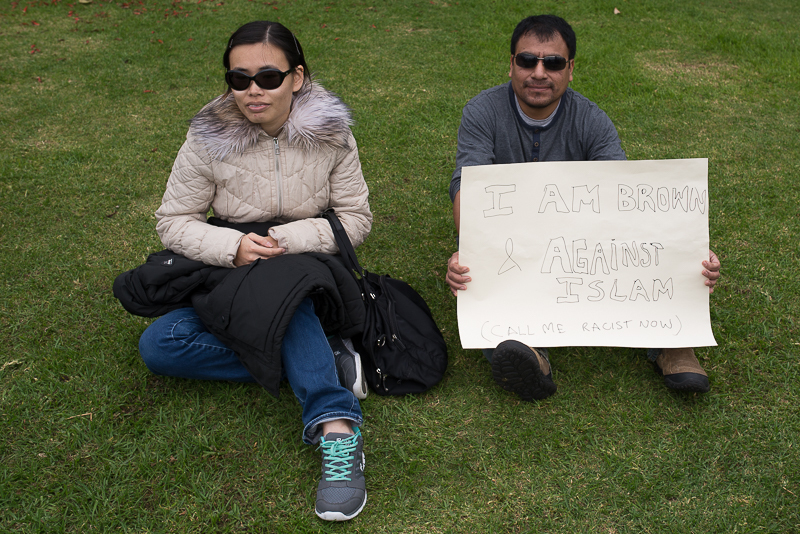 Right: We are also not racists. 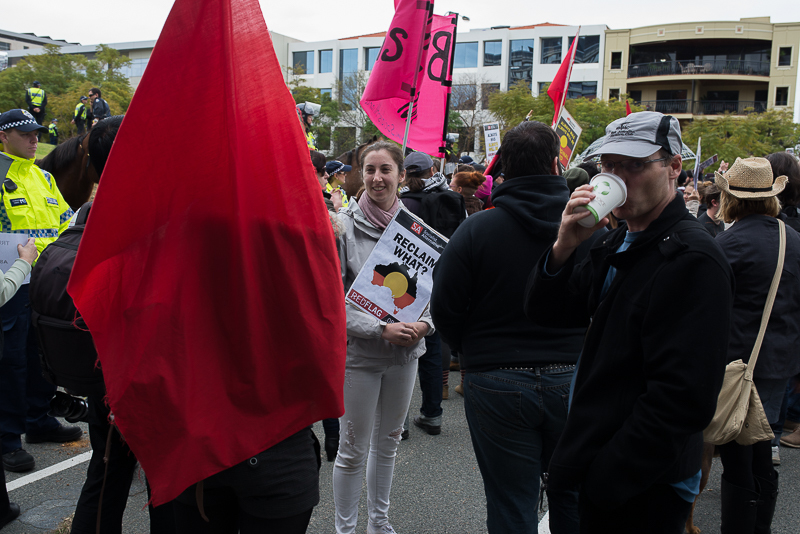 The left are communists and socialists happy to see Australia draped in ISIS flags and public beheadings in city centres. To us, neither side really gave anything to the public debate worth digesting. 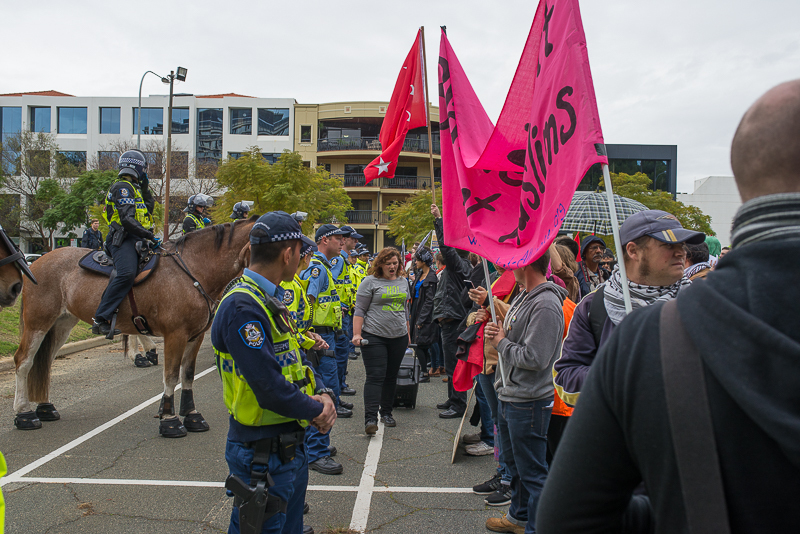 Both sides seemed to have underlying motives for waisting an otherwise fine Sunday afternoon, of which little had to actually do with preserving the Australian way of life. Tokenism comes to mind when reflecting on what we saw. 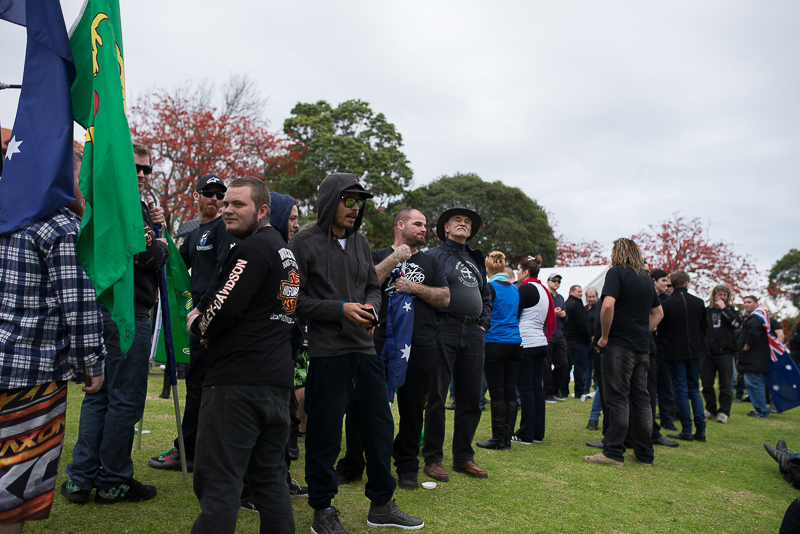 The reclaim Australia speakers were seemingly carefully selected to represent as many minorities as possible, in a way to immediately shut down any argument that they are a bigoted, racist or prejudiced movement. 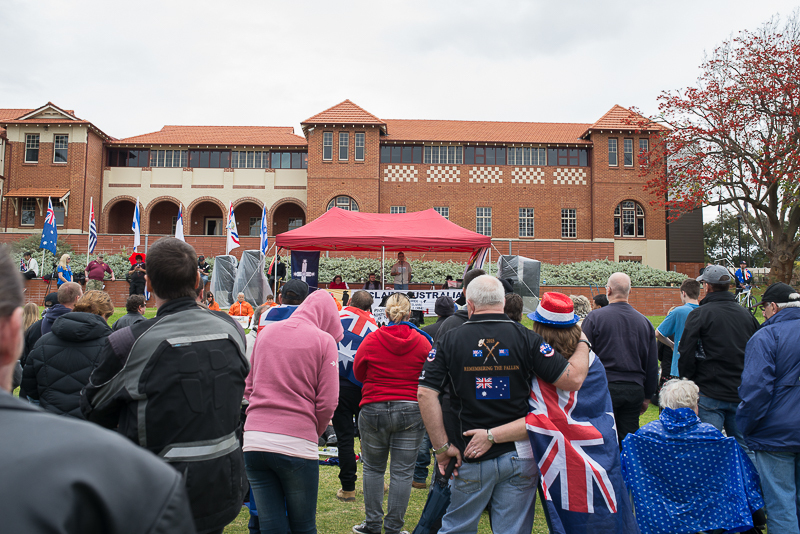 Yet, the fact that the sole premise of reclaim Australia is to remove Muslims from Australia is quite obviously an act of extreme prejudice. 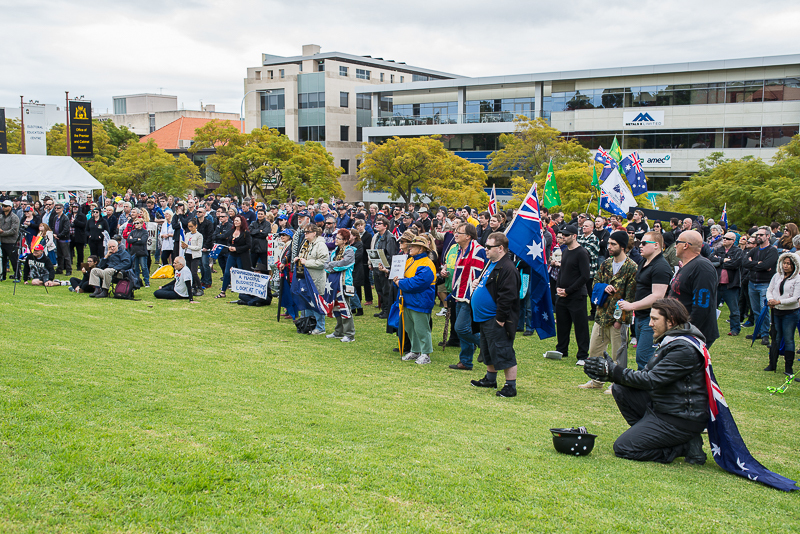 The supporters of the reclaim movement are, as is obvious to see in the photos, predominately white, low and middle class; although speaking of class could be considered asinine, it’s the lower classes that are the least educated within our society and most venerable to media manipulation, such as over-reacting to extremist Islam. Sanctimony – righteousness accompanied by an unwarranted attitude of moral or social superiority; smug or hypocritical righteousness. 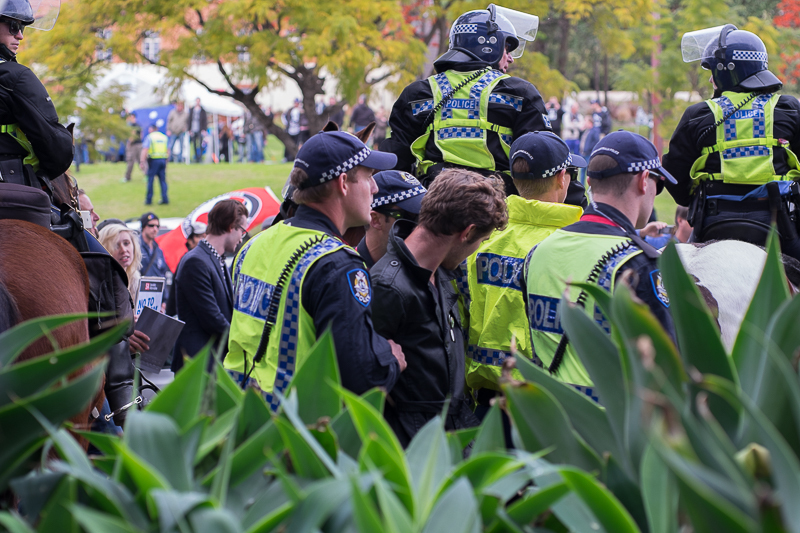 One of the reclaim protestors being arrested. 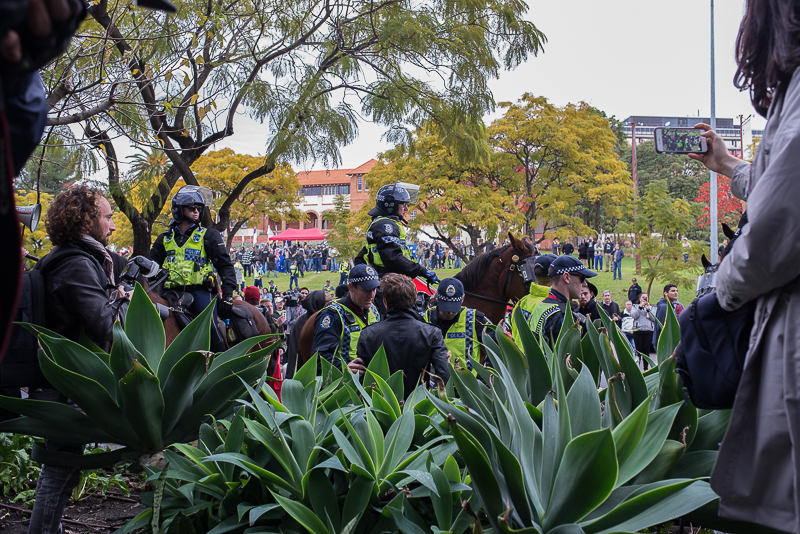 We were unable to ascertain for what reason, but after the violence in the Melbourne rally the day before, the police were vigilant in maintaining the peace. 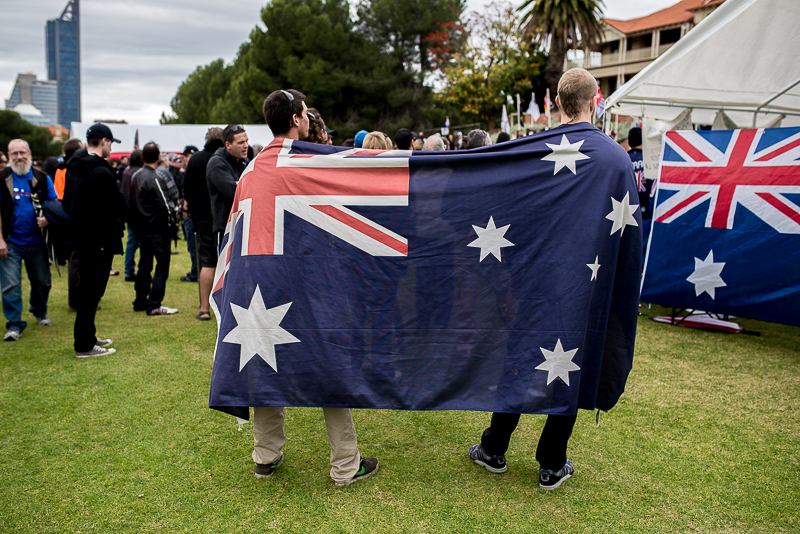 Xenophobia – a dislike of or prejudice against people from other countries. 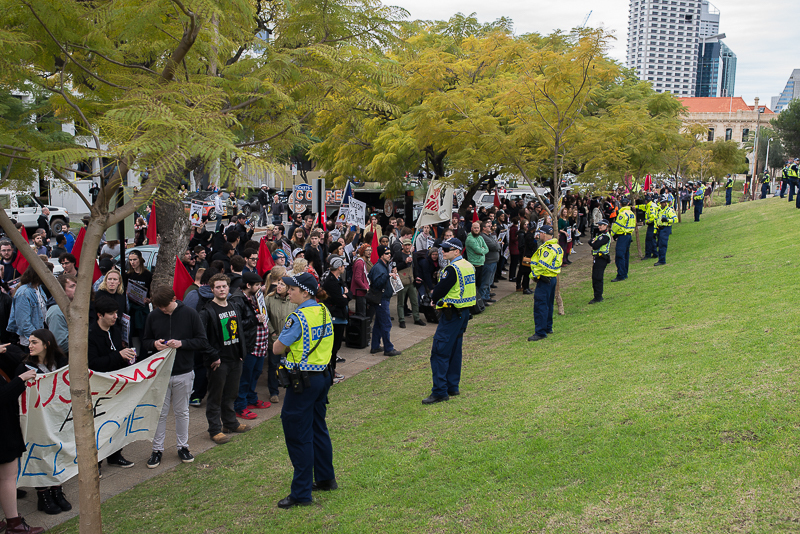 The impotence of the reclaim side was obvious to anyone of reason, yet movements like these can create dangerous divides within societies. 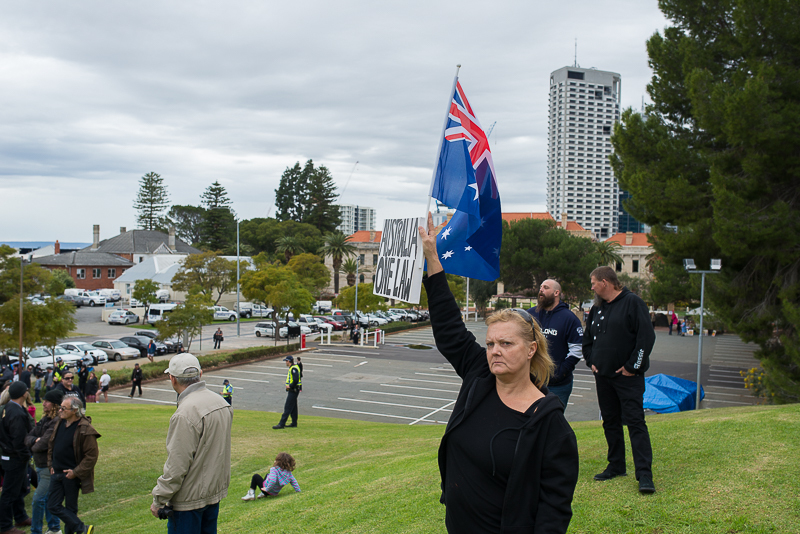 Especially when the anti-reclaim protesters are doing nothing but validating the reclaim “cause”. “You dirty red”, ” You’re a dirty commie aren’t ya”. 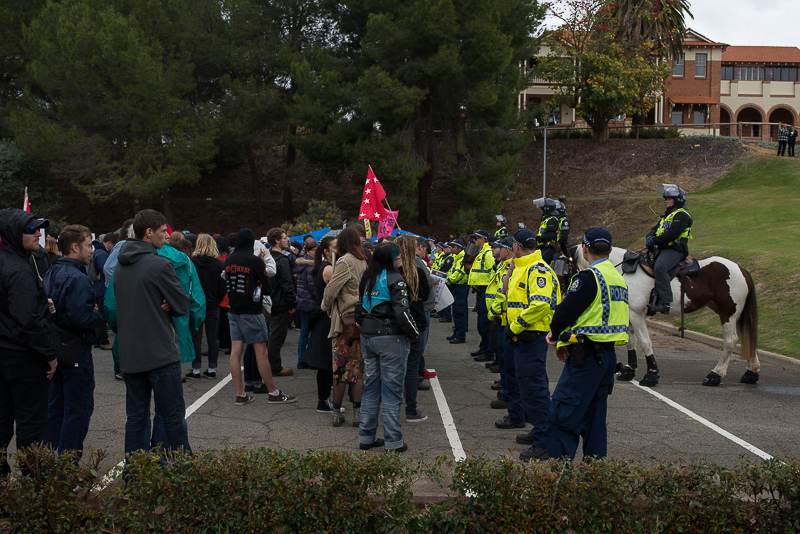 These were the supposed insults spat at us as we documented the rally by the supporters of the Reclaim movement who had lobbied the police to forcibly remove us, due to their suspicion we were undercover “lefties”. If only they knew we thought so little of both sides, to be associated with either would be the equally insulting.